Prince Derek's fan Girls.... Dereka nd all of his lovely fangirls :) (P.S. His favoriete fan Girl is Megara ;)). Wallpaper and background images in the disney crossover club tagged: belle megara lottie jane wendy aurora jasmine mulan pocahontas derek. 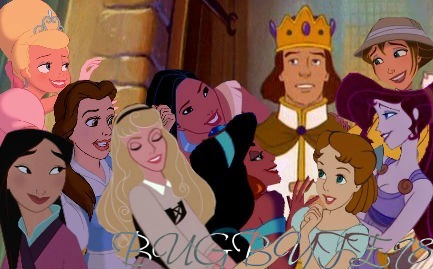 This disney crossover photo might contain anime, grappig boek, manga, cartoon, and stripboek. Derek is such a lady's man! Haha, this is like my Dodger picture I made. What's your secret to how you carefully edited this image or is that confidental? Oh!That reminds me!I'm trying to edit an image of the scence where Cody falls off the cliff,but i can't D: .